"Dog bloat (GDV, food bloat or gastric dilation-volvulus) refers to a condition where a dog's stomach bloats and can twist. A normal stomach should be contracting and releasing food. A dog with bloat takes in excess air or food, causing the stomach to be distended. It cuts off the blood supply and keeps the food and air from exiting. It is a life threatening disorder with fatalities ranging from 10% to 60%. The disease primarily occurs in large deep-chested dogs between the age of 2 to 10 years. No one knows what causes the condition. It frequently occurs several hours after a large evening meal with symptoms occurring around midnight. Risk factors for bloat include being a large breed dog (highest percentage of dogs) that is deep chested such as a Great Dane (long length chest with small width). Other risk factors are age (over age 7), rigorous exercising after eating or eating too quickly. It is a myth that an elevated dog food bowl will decrease the risk of developing GDV (2015, Cornell Veterinary). In fact, the risk increases with an elevated bowl. Food bloat refers to bloat without the stomach twist. The twist is referred to as volvulus. The exact reasons why dogs suffer from bloat are not understood and not all cases are associated with the identified risk factors. Always contact a veterinarian if you aren't sure or if there is any chance that your dog is suffering from bloat (see second video on page for dog suffering from bloat symptoms). Veterinarians will work to remove any air or food from the stomach. Surgery is needed if the stomach moves out of its' normal position, such as a twist or volvulus. Prevention includes having a dog eat slowly and rest after eating a meal (1 to 2 hours). The condition can happen at any age, although middle aged and older dogs have a higher risk. New research (2015) shows that IT IS NOT TRUE that a lowered food bowl can lead to the swallowing of air (aerophagia) which could lead to GDV. Abnormal tumor or cell growth may also lead to GDV. More research needs to be conducted. With bloat, the stomach fills with fluid. Gas and fluid continue to build before the stomach rotates. As the stomach enlarges (becomes distended), pressure increases in the abdomen leading to compressed blood vessels in the abdomen. The reduced blood flow can put the dog into hypovolemic shock. The disease can be characterized in three stages of dog bloat. The goal of course is to stop the disease before it proceeds to stages II and III. Pre-bloat: Stomach function is normal, but gas accumulates in the stomach and it is not emptying as it should. Stage 3: Spleen and stomach tissue become necrotic (start to die off). Heart failure and shock set in and is irreversible. Can result in death. Your emergency veterinary center will drain the stomach and then attempt to reposition the organs. Half of dogs with bloat do not survive making early diagnosis and treatment is critical. Bloat is actually made up with two conditions. The first, called gastric dilation refers to the stomach filling with food, fluid and gas or air. The second part of the condition is called volvulus, which refers to a stomach that rotates. The twisting can range from 180 to 360 degrees in a clockwise direction. The stomach twist causes part of the stomach, the pylorus to move out of position. This prevents air and fluid from leaving the stomach, through what is called pylorus canal. The twisting prevents fluids from leaving your dogs body, not just stomach fluids, but the ability to vomit as well. The condition cuts off blood flow to the stomach tat causes cells to start dying. 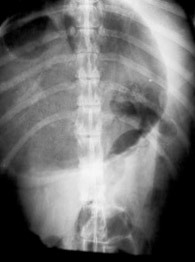 Since the stomach cannot drain, it becomes distended, interfering with circulation in the stomach and the death of cells in the wall of the stomach (called necrosis). As the stomach starts to fill or become distended, pressure increases. This compresses the abdominal blood vessels such as the portal vein and caudal vena cava. The lack of blood flow results in less blood going to the heart and a condition call hypovolemic shock, where there is less blood circulating in the body. Shock can occur from the low blood pressure and endotoxins that rapidly develop. If the stomach ruptures, a condition call peritonitis can occur, which is an inflammation of the membrane that lines the wall of the abdomen and covers the abdominal organs. This in turn causes problems throughout the body such as organ death, inflammation and blood clotting (coagulation). Video: Bloat Symptoms in Dogs Bloat is best known for having a distended abdomen. The condition can be hard to detect, particularly early. Treatment is considered an emergency with hospitalization required. 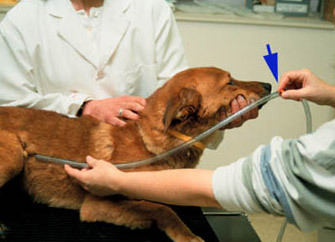 If the dog is suffering from dilation of the stomach (gastric dilation) then a tube is passed through the mouth to empty the stomach (orogastric intubation). The stomach is washed out. The patient cannot drink or eat for 36 hours followed by intravenous fluids. Once symptoms subside, then the dog is allowed to resume a normal diet. In extreme cases an owner may do it themselves using a tube coated with K-Y jelly." If a tube cannot be placed through the mouth, a transabdominal needle (percutaneous gastrocenteis) can be attempted. The veterinarian will use a catheter or large needle. Antibiotics will be used in cases where an infection has taken hold. 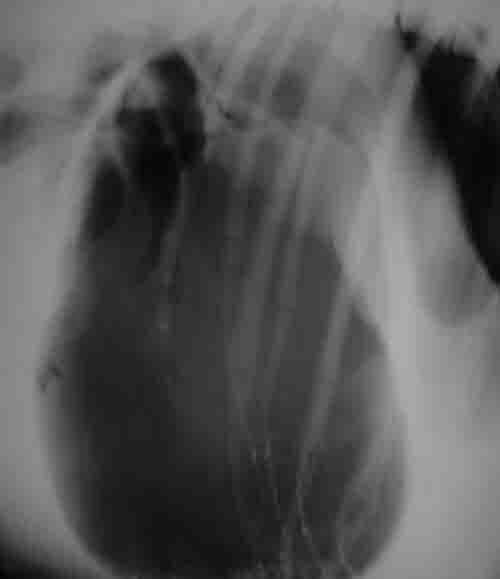 In dogs that triggered a heart problem, an anti-arrhythmic may also be required. 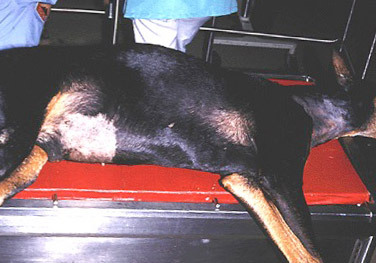 Dogs are sedated before inserting the tube that will be used to empty the stomach. Fluids are drained with gravity or with a syringe or suction pump. Surgery is used if the stomach has twisted and all of the organs need to be placed back into their normal position. Surgery is used to correct stomach twisting (volvulus). The surgeon will reposition the spleen and stomach. Partial removal may be required if some cell death has occurred. 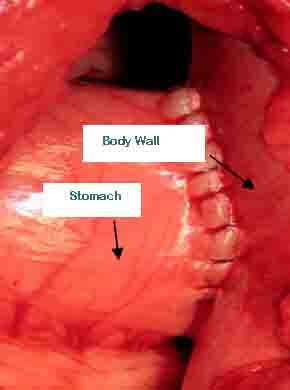 Suturing the stomach wall to toe abdomen can help to prevent future problems (called a gastropexy). Antibiotics are used to prevent infection associated with surgery. Patients need to be monitored for lack of blood flow to the cardiovascular system. Fluid therapy is used based on the health of the patient. In some patients premature ventricular contractions (change in heart function) occurs and needs to be monitored. Kidney and liver function will also be checked after surgery. Dogs will require restricted activity for 2 weeks after treatment. Once the patient has recovered, food can be provided orally. Emergency dog bloat surgery (gastropexy) will cost between $3,000 to $8,000. The cost depends on the length of required post-operative care. If your dog lives a distance from a vet, then a home dog bloat emergency kit makes sense. The kit contains instructions and a tube that can be passed through the mouth into the dog's stomach. The tube will remove air and decompress the stomach until you can get to a Veterinarian. Avoid strenuous exercise when the dog’s stomach is full. Wait until 1 hour after eating. If you dog gulps food, slow the rate of eating by buying a dog food bowl that has multiple small compartments, which slows down the dog. Free feeding can be a preventive if a puppy continues to graze as an adult. Puppies free-fed will usually eat small amounts through the day. If the dog remains a grazer of food as an adult then the risk of GDV is reduced. Treated dogs that do not have damage to the stomach (necrosis) have a 98% survival rate. Dogs that have gastric necrosis have a 66% survival rate.